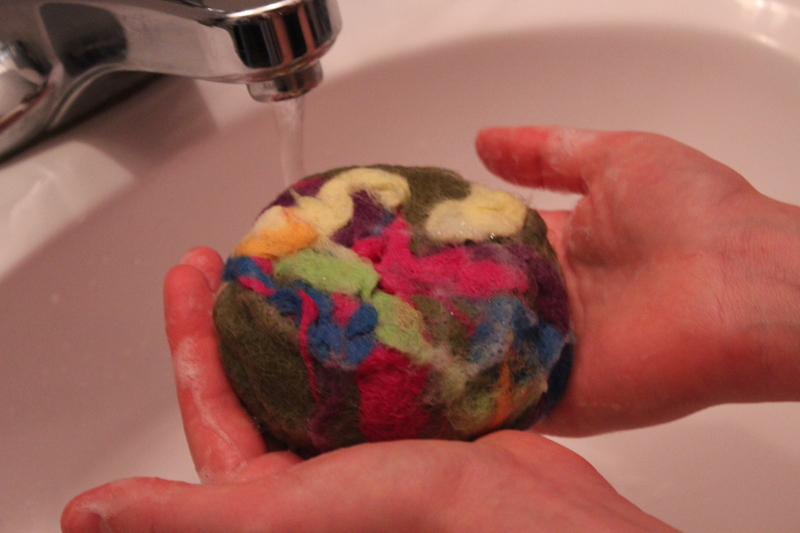 A felted soap is like like soap with a jacket on! It is lightly exfoliating, and a great way to make your bar soaps last longer. When washing up, it is a magnificent washcloth-and-soap-in-one! It is simply; a bar of soap, wrapped in wool roving that is then felted around the soap. 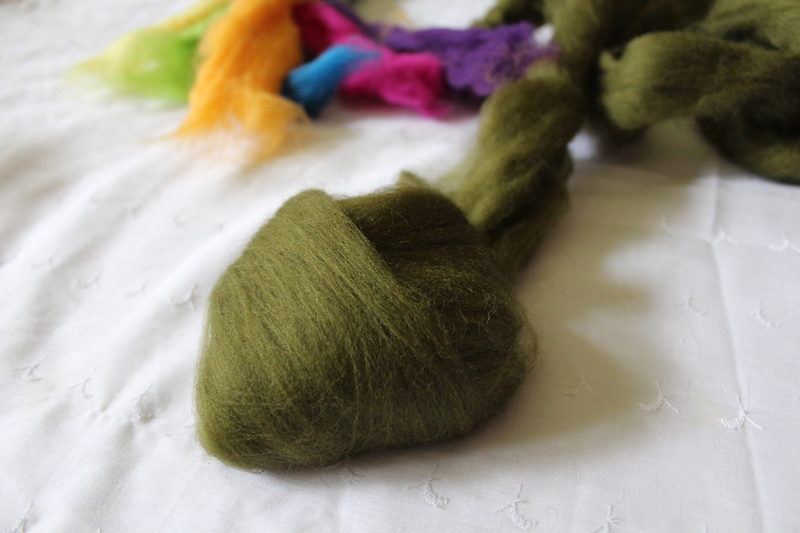 Felting is one of the earliest recorded forms of textile processing. It was a process heavily relied upon by Asian nomadic tribes. It is the abrasion of wool which results in the wooly fibers attaching to one another to form a mat. Wool is an ultra-renewable resource we graciously get from fiber animals, whose fast growing coats provide the ultimate survival material. Not only are fiber animals portable, but they are great for herding and sustain nomadic life quite well. The wool from such animals can easily be felted down for clothing, tents, horse tack, and many other daily items. The end result is a cloth that is lightweight, breathable, fireproof, and even windproof, when thick enough. Wool has sustained nomadic tribes since time immemorial, and is quite a miraculous fiber. Contrary to popular belief, I am not crazy, nor are my ideas 🙂 I first learned about felted soap from my friend who suggested it as a method in dealing with a batch of Dear Husband’s homemade soap that we thought might be too soft. After looking into it more, I learned it is a very old craft method as well as a craft commonly made in Waldorf schools. A Google search returned many places to buy bars of felted soap, the most incredible being the trendy store, Anthropologie where they sell these babies for $16 a piece. 16 dollars! That was the price I paid for a HUGE bag of wool, enough to felt probably 30 bars of soap! 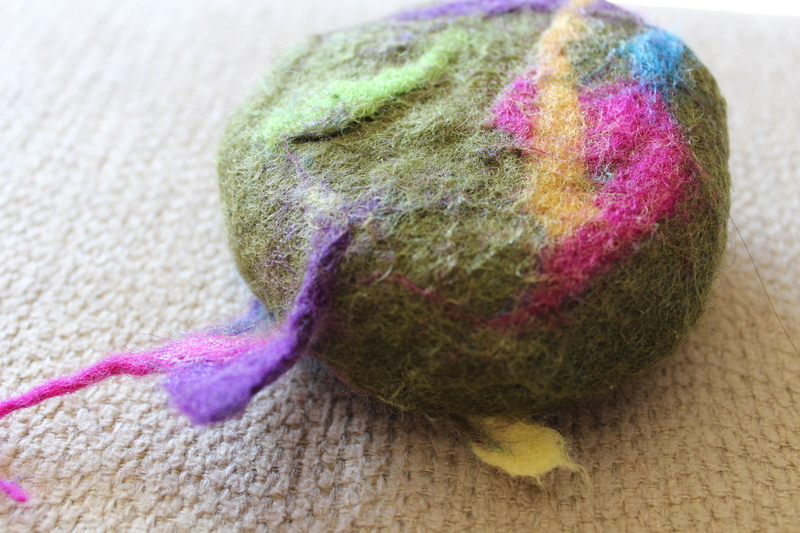 I am sure some people easily pay that price or a similar one, because the end result of a felted soap is so neat. (Also, the bars for sale at above named store weren’t even needle felted with a design). As far as needle felting goes, I am totally not there yet in my craft skills, but will be one day, and I will be sure to share the journey. For my maiden soap felting odyssey, I used the remainder of DH’s homemade soap. They were round bars of a great-lathering soap with lots of coconut oil in them. (I deduced for a successful soap felting project, a good lather is key. Helpful in the felting process, but also when washing with it. If you can’t get a good lather through the wool, it won’t be any fun to wash with). Lay your base wool flat and place your soap on top of it. Don’t pre-cut a specific length, just pull one end of the roving loose from what you’ve got and start wrapping with it. make sure all sides are covered and no soap is showing. I ended up with 2-3 light layers, and DH just did one layer, and they both felted up fine, but I preferred the thicker laye rand think it may hold up better over time. (Cut or tear the roving now to sever it from your pile). 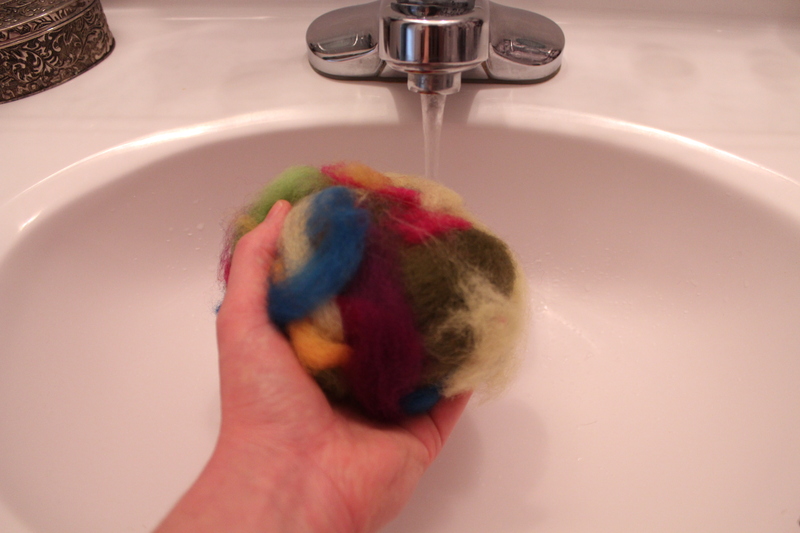 Pull small wispy pieces of wool from a color other than your base if you wish to decorate your soap. I used green as my base color, and many other bright colors to embellish it. Place these wispy pieces haphazardly about the top of your base wool. *The decorative wool in the first photo on the left felted up much better than the photo on the right. 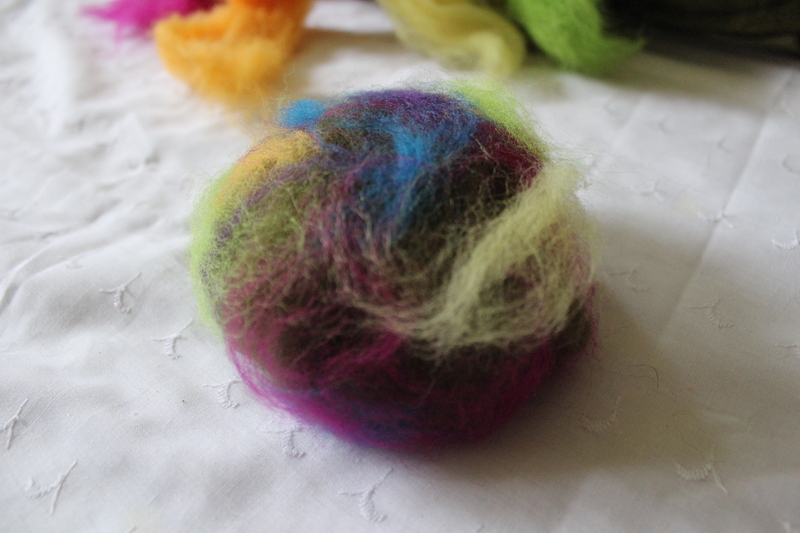 The trick was to use very small amounts of the decorative colors so all of the fibers lay flat against the base color. **If you are using an old pantyhose, now is when you would place the pantyhose around your whole soap and wool creation. Snip off a length of pantyhose so you have a tube with two open ends, and pull it around your soap, taking care not to move the wool too much and that no soap is showing through the wool. Tie knots at each end. 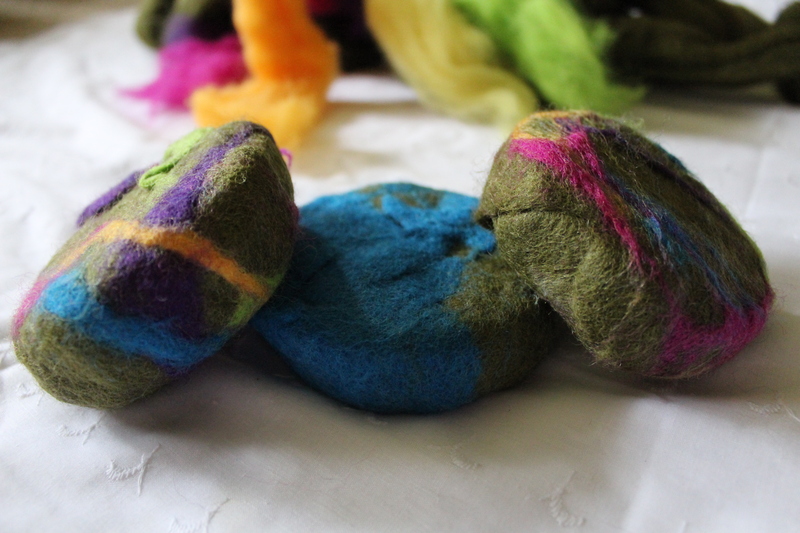 This method is great for felting with young children, as it helps to keep the wool in place around the bar of soap. I did not use this pantyhose method, but there is plenty of info on this method available. Next, gently drizzle the hottest water you can stand on top of your wool, taking care not to be too abrasive at this stage because your wool will slide from your soap if you do. Wet until you achieve the consistency of “wet cat.” Unfortunately, I missed the photo op for that stage. 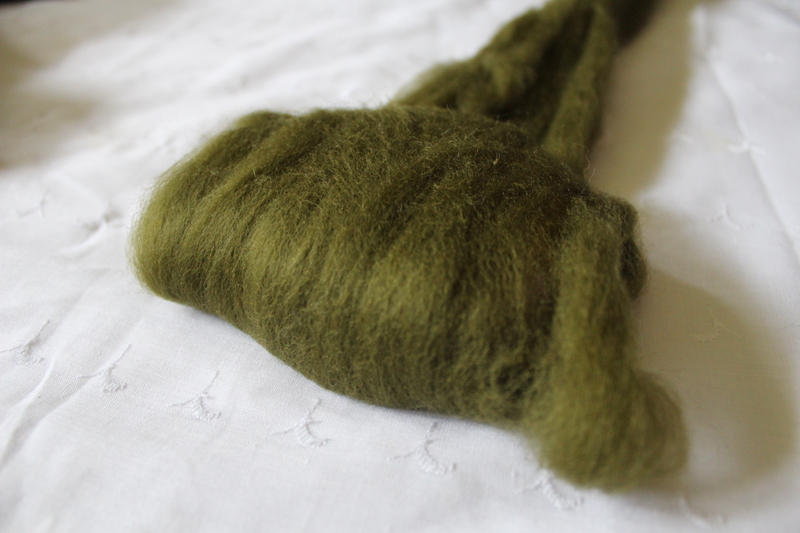 The next photo shows the wool fully soaked and beginning to lather. Press into the soap and gently massage in small circles to achieve a thick lather. At this stage, I was spinning the soap around in my hands, and roughly agitating all areas to encourage the wool to stick to itself. 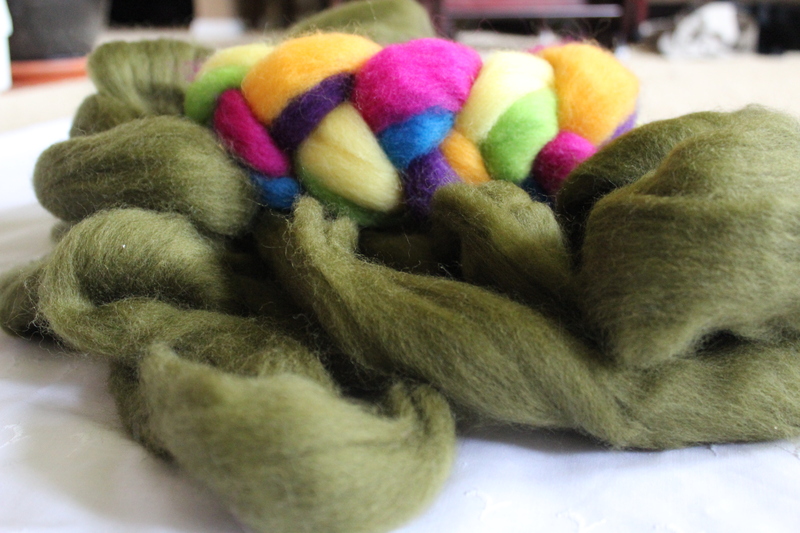 Wool fibers have scales, like human hair, and the scales are what catch on one another create the felting process. I periodically rinsed the suds off to see where the wool was at in the felting process, and alternated between hot and cold water. I did not constantly massage under the running water though. Continue to massage and agitate the wool, quite roughly at this point. Be sure to get all sides of the bar, whether it be a rectangle, a circle or an oval. If you are using a felting board, bubble wrap, or a bamboo mat, at this point you would be rubbing the wool against that surface. An abrasive surface makes the wool felt up faster. I didn’t have one, so I just did it by hand, and it took me probably 15 minutes. When your wool begins to shrink around your soap and has all clung together in an irreversible, matted mess, you have achieved success! Wring the remaining water from the bar and allow to dry. If you wring the water from the soap and still see suds on your bar, that is perfectly ok. The bar will continue to felt each time you use it. If it takes a bit to get a lather on your first wash, be patient, it will come. Wring the water from the bar after each use and it is best to place your bar onto a soap dish that will allow the bar to drain and dry after each use. I have washed up with my bar a few times since making this, and have thoroughly enjoyed the results. With felted soap, you can save money in having your soap last longer and you have the freedom to toss your loofah in the trash and ditch your body wash! If you use washcloths, you will enjoy not having to use and wash them regularly. 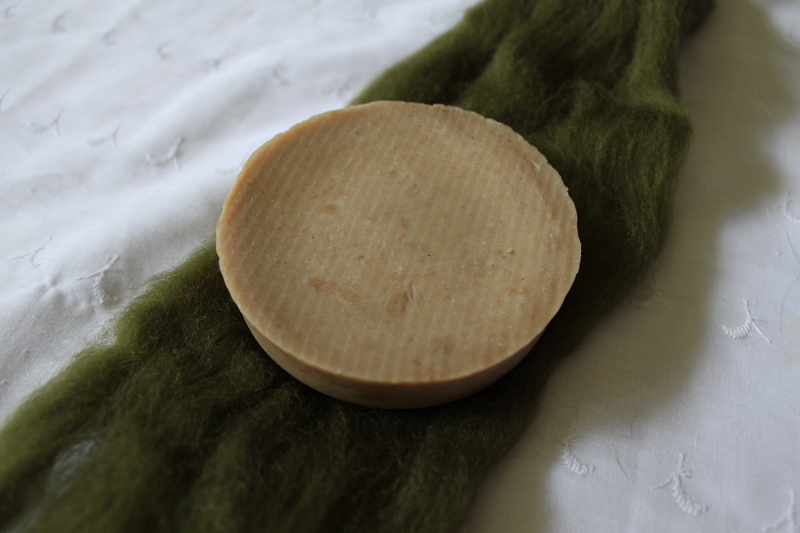 The wool lightly exfoliates, and with the right soap, the bar is cleansing, nourishing and moisturizing! About.com has a great tutorial. Fuzzy Galore gives superb background information. Wow I have never even heard of felted soap before. Thanks for another great idea!!! I will have to make some. This activity looks like a lot of fun and really rewarding! I will be trying this very soon. I will also keep this in mind for birthday party activity ideas as my daughter gets a little older. Tween seems to be a good age for this, right?! Thanks! BTW, I love your site and the many life benefits it is giving me. Thank you! I have a friend who made some of this for us to sell. Some people love it and some people just look at it like they have never seen such a strange thing before. This is so cool! It looks like a great craft for kids especially those little ones who would love nothing more than to take up residence at the sink. Really brilliant! We are going to do this! Was just talking to a friend who felts about coming over and working with my kids, teaching them the craft. Well, now we have the perfect project! Really great! Thanks! Fascinating, beautiful and such a wonderful gift idea. Thanks so much for sharing! I found you on Little House in the Suburbs Linky Party. added the bits of color. I use a soap cozi. But I like the felted wool idea! I buy wool sweaters at the thrift store to either turn into wool dryer balls or felt them and make cloth diaper doublers …is there a way I might be able yo recycle a sweater into this? I wish I had a good answer for that. I honestly have no idea. Perhaps someone else can chime in on this? My best guess is probably not. take into account, a lot of wool on the market for clothing has already been treated so that it won’t shrink at all or much. if you go to a hobby store (i.e. hobby lobby, michaels or joanns) you will see two kinds of wool. natural wool which can felt or shrink and natural treated wool which will resist shrinkage. plus, a lot of sweater may look like wool but be a blend or synthetic look-a-like. 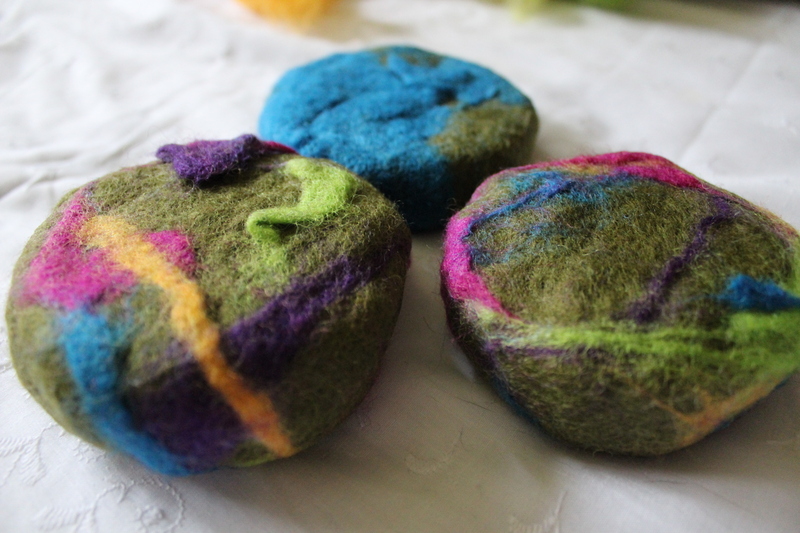 I’ve never heard of felted soap before-so cool! Thanks for sharing. this is a cool idea, thanks. i was wondering if you have ever felted the remaining pieces of soap with the wool? that is if you had any left over which were not felted. Does the soap need to be hard-milled for this to work? I’m wondering whether glycerine soap is too soft to use for a felted soap. Something similar to the clear soaps at The Body Shop. I think traditionally, part of the reason to felt a soap was if it was too soft? That has been said to me by a few of my friends. I haven’t tried it with a glycerine soap yet, but it the soap gives a great lather, it will work fantastic! The only time I’ve been disappointed is with soaps that don’t lather very well. It takes forever to get the bar good and soapy. I have seen craft-site estimates of 5 to 20 gm for 1 covered bar. I budget 20 per so I can use a large handmade bar, and give it a nice jacket of wool. Leftovers? Use them on little hotel soaps if you have to! I pay up to $3 per ounce (28 gm) from U.S.-based eBay sellers, up to $5 per if it’s from a farmer-spinner at a show (like my angora goat farmer friend). I am going to use up a cache of glycerin soap soon such that my friends unfamiliar with felted soap will see the benefits of the felted part sooner than if I used a hard-milled bar. It takes a long time to get to the re-use part of the life of a bar of hard soap that’s been felted, the wad of beautiful felt good for scrubbing things!! what do you do with the wool blob after the soup is gone? Just throw it out? I haven’t found a good use for it yet, but it might make a good loofah or other scrubber? I’m curious about the synthetic loofah. Does the word loofah apply to more than the tan cylindrical-ish thing with the three holes through the length? It wouldn’t be right if it did. What is properly known as a loofah is not synthetic, its grown. Its in the melon family. I’ve felted soap before, when I first started making soap. I stopped because its time consuming. But if people get $16 a bar, I may try it again. People use the word loofah for those mesh/net looking puff balls you see in grocery stores. Made out of plastic or some other oddity. I wad wondering if you ever had issues such as: wool does not felt together, i have some wool I purchased to needle felt with but it just won’t wet felt. 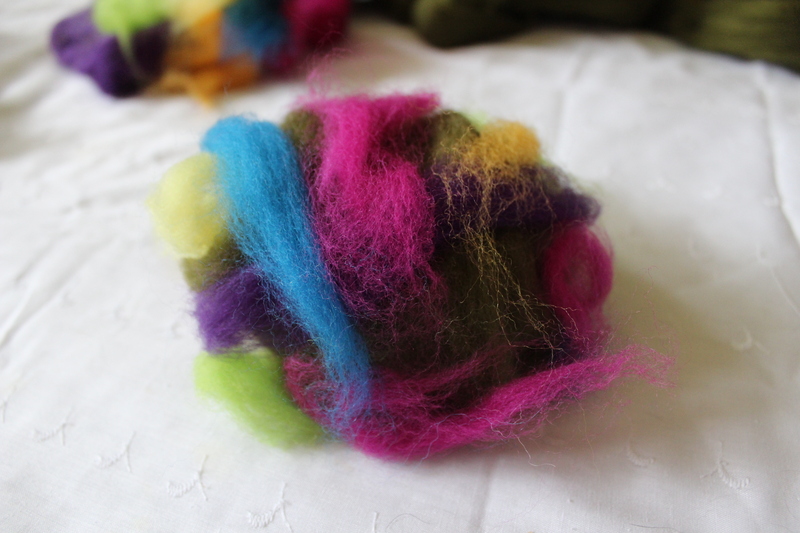 I purchased more roving and some of felted on the soap perfectly while others never did, it just slipped off. I definitely have some trials that come together easier, that’s for sure! In the end, I have been able to make it work, but some pieces have sort of jutted out and I clipped them off. I’ve tried this project on multiple occasions and the soap always turns to mush after a few uses. I’ve tried commercials soap and bar of Goat’s Milk Soap that a friend makes. She even added a stabilizer ! What am I doing wrong?